Do you ever feel like I’m talking directly to you on the podcast? Is this the kind of connection you dream of creating with your audience and clients? This week, I’m showing you how you can talk to your ideal person, get in their heads, and serve them fully from your heart and soul. 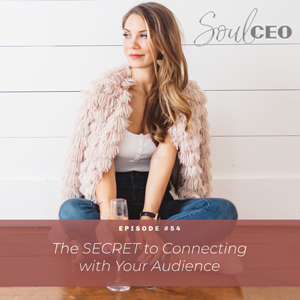 I’m sharing a process I use when I envision my ideal audience so that you can apply this and give yourself the power to truly connect with yours. Tune in today to learn how you can inspire change in others and give them everything they need to make powerful decisions in their lives. You might be surprised to know that you can do this without worrying about every post you make or everything you say being perfect. The biggest mistake I see people making in marketing and branding. What I think about when I’m creating my marketing. How to use my process to get in the minds of your ideal people. Why I don’t follow a sales or marketing process. Hello hello, how are you guys? I am so excited to be here for another episode of Soul CEO. I love you guys so, so much. I am so grateful, so honored to be a part of your journey as always and I love it when you take a quick screenshot and you share on your Instagram story and tag me @lindseymango_ when you are tuning in. You never know who needs to hear this message, and so not only do I love to see the love, but I also love to see other people get hooked on this podcast because my goal is to inspire change in the world and to help as many people as humanly possible. So I’m so excited, as always, to talk about today’s topic, which applies to business, but just like everything else, can apply to your life as well. So take this lesson and apply it to what you are working on. And it’s this idea of getting in your audience’s head, or getting in other people’s minds. So I’m a huge proponent of being a thought leader, of not doing things in life, in business that everyone says you’re supposed to do them. If I did that, I’d have a real job. But doing things in the way that aligns with your heart, aligns with the things that you want to create in the world. So I think that is first and foremost, most important. But after that, what I see so many people do wrong when it comes to marketing, branding, when it comes to having a relationship with the people they love is they stay in their own mind and they speak to their audience, to the people that they love from their own perspective. And while that’s amazing, I’ve realized the thing that has separated me on social media, in business, and in life, and that makes me a really good marketer, makes me an expert marketer is my ability to get into the heads of my audience, and so that’s what we’re talking about today. How to get in the head – first to be aware of it and practice it, but then how to actually get in the head of the person that you are serving, of your ideal client, of your significant other, whatever it is because if you can live in their world, you can see things from a much different perspective. You can speak to them in an amazing way. I want you guys to imagine if you’re not spending any time in their mental world, it’s like trying to teach microphysics to a kindergartener. If you’re speaking about microphysics – I don’t even know what the hell that is, but I’m making this up – and you’re trying to teach it to a kindergartener, are you going to explain it the same way? And if you keep explaining it in the way that a professor would understand, a kindergartener is not going to understand what you’re saying and they are not going to connect with it. So once you get clear and in alignment with your own desires and what you want to offer the world, losing all of the rules, the next piece of this is getting clear and getting in your audience’s head so that they can connect with it, and this is something, like I said, people struggle with. Because as you guys grow in your business and in your life, things make so much sense in your mind, but they don’t necessarily in the minds of the people that are learning it because they aren’t where you are, which is why you are a mentor or a leader or someone that they look up to in business or in life. So first, we need to be aware of like, are you actually getting in their mind? Are you thinking about how do they think, how do they feel, what’s going on in their world, how can they relate to this thing that I’m offering or this thing that I’m doing? Then, you need to figure out how to do that. So I’ll give you guys kind of just like, I don’t have a set process but I just want to share with you what I think about when I create a program for example, or when I’m creating my marketing. I always think first, how do they feel right now? If I can take myself back to that place because typically, a lot of y’alls ideal clients or the people that you’re inspiring or around are maybe where you were a year ago, or they’re just two steps behind you. So I always think to myself like, what are they thinking and what are they feeling? And I go to where they are. So I think about for me, I think about the girl who’s stuck at her corporate job, I think of the girl who has so much in her heart and soul and just knows she has this potential inside of her but just isn’t sure how to get clear on it, she isn’t sure where to take it. I just like, live in her world for a second and I think about what feelings is she experiencing. What is the inner monologue that’s going on in her mind? So something you guys can ask yourself if you’ve built a program, if you’re trying to recruit people into your network marketing company, whatever it is, whatever your business is, I want you to really start to ask yourself like, what is my ideal person, the person that I truly want to serve in my heart and soul? What do they think? What do they feel? Come up with like, six things. Six thoughts that keep coming into their mind. Come up with six feelings that they are continuing to experience. These can be negative and positive. These can be things that are going to come up that inspire them and these can be pain points and things that they’re struggling with. So some of you guys might be listening to this and you might be like, “How does she know me?” How I know you is one, I’ve been that person. Two, I like, think about what you are experiencing and then I think about the feelings that you’re experiencing. So what is that? Frustration, overwhelm, excitement, possibility, I don’t know, nothing really comes to mind other than that. But this is the process that I go to. I really take a look at what they’re thinking and what they’re feeling and then any time I’m marketing or talking on social media or speaking in general, I envision that I’m speaking to my ideal client for whatever program or whatever thing that I’m talking about. Social media in general, I just talk to that person. And when you can talk to that person, they are going to hear you. You want people to hear what you have to say and think, “Oh my gosh, she knows me. How does she know me? How does she know what I’m thinking?” And the way you do that is by getting in their mind and that is how you create marketing, you create a business, you create a brand, you create connection to your audience. The other way that I apply this is thinking about what they need in order to grow, what they need to learn, and that’s what I teach on this podcast. It’s what I do my free trainings on. I live in their world. I also have been practicing doing this in my personal live. So it’s so easy to stay in our world. We had a busy day, we’re rushed, we’re doing all the things and getting to the end of the day and coming home to your significant other, whatever it is, and being stuck in your own world and just asking how their day was but not really listening, whatever it is, I’ve been working on practicing living in my fiancé Chris’s world and thinking like, what is he thinking right now? What is he feeling right now? And how can I connect with him on that and ask him too? It doesn’t necessarily mean that you have to make it up. But when you do that, you give yourself the power to truly connect with the people that you are meant to work with, to truly help them feel understood. I was actually – I’m reading a book called Millionaire Success Habits by – his name is Dean, I forget his last name. But it’s been really amazing. Some of it stuff that when I’m reading it, I literally feel like I wrote the book. I’m not where he is. He is like, multimillion-dollar companies and just has written so many books, but I’m like, oh my gosh, this is all the stuff that I apply, and then it helps me take stuff to an even deeper level. But he was talking about how sales tactics and marketing strategies will always lose against someone who is connecting fully with their audience, to someone who is speaking from their heart, to somebody who is living in the world of their audience and is making them feel – this is the key word – understood. He said when you make your people, people you love, the people that you work with in business, your audience, when they feel understood, they will connect with you. That will win over sales tactics, processes any day. I’m not saying that stuff isn’t valuable, but I’m saying if you can do that and that’s for me why I honestly – I’ve helped you guys through some of my podcasts like on sales and things like that, but why I’ve never really followed a process. I just intuitively pay attention to what is it that they’re thinking, what are they feeling, and getting in their world and helping them feel understood. Because if you can do that, you’re going to help inspire change, you’re going to help inspire them to create change. You’re going to give them what they need to make powerful decisions, and that’s where you can feel connected. So I’m so excited to hear about how you guys apply this work. Spend time getting in the world of the people you love, getting in the world of your audience, getting in the world of your ideal client. Think about how they feel and make sure that you’re speaking to that. Make sure you’re connecting on their level. It will make you so powerful and it won’t matter if what you post and what you say is perfect. It will matter because it will connect with them and they will feel understood. I love you guys, I hope you have an amazing week. Go out and apply this work. Practice posting on social media, telling your story that will connect with them. Make it about them. It will make you limitless in business and in life. So I love you guys, I’ll talk to you soon. I hope you have a beautiful day. Bye.